This documentary came out in 2010 about the 2009 Van Cliburn Piano Competition. All three medalists that year were Asian: Haochen Zhang (19, China); Nobuyuki Tsujii (20, Japan); and Yeol Eum Son (23, South Korea). Di Wu (Chinese-American) was also one of the six finalists but did not medal. 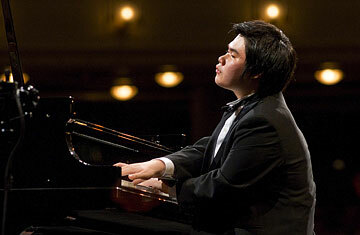 For the record, only one of the medalists of the most recent Cliburn Competition (2013) was Asian. Coincidentally, Naomi Kudo was also a contestant at this competition but did not advance. The video of her playing the Vine Sonato in the other thread is from this year. Also, if I am not mistaken, this was the last time Van Cliburn himself (who died in February 2013) attended the competition that bears his name. He is seen at the end of the documentary, gaunt as ever, presenting the awards. The documentary itself is pretty standard. There is a lot of montage work, sometimes cutting footage to match single notes, and a lot of interviews with the contestants' hosts. Apparently, the contestants are "hosted" by a family with a practice piano for the Cliburn and not stuffed into a hotel. The undisputed star of this video is Nobuyuki Tsujii, who is blind. He shared the gold medal with Haochen Zhang (the bronze medal was not awarded). There is another version of the promotional poster for this documentary that features him alone, and he has apparently been something of a sensation in his home country of Japan ever since. One of the more interesting parts of the film is the way that Nobu used the sound of breathing to coordinate with the other personel when performing chamber music or concertos. The non-musical highlights of this documentary are probably a Russian contestant being denied alcohol at a restaurant because he did not have ID; the Bulgarian contestant going everywhere with a popped collar and bringing his own piano bench, which he kicked on and off stage; the seemingly unstaged difficulty with which the jury came to a decision on the six finalists; the Italian contestant's adorable accent; and Yeol Eum Son's habit of doing calisthetics before a performance. Something should be said about the competition's requirements, which I was not aware of until watching this film. The Cliburn is maybe the most demanding of the major piano competitions. Applicants are supposed to give a free recital which a jury member attends in order to be accepted for the competition. Then there is a 45-minute preliminary round, a secondary round consisting of a 60-minute recital (including a commissioned work) and a Piano Quintet from a selected list, and then two concertos by two different composers. So essentially every contestant must prepare him/herself to play five concerts in three weeks, including two complete concertos back-to-back. I wonder how many young unrecognized pianists there are in the world who are even capable of completing this regimen to any degree of satisfaction when this contest comes around every four years? There have been criticisms of the Van Cliburn Competition as well as the music competition format in general. This article appeared in the Wall Street Journal specifically about the 2009 Cliburn results. Other critics have publicly questioned if the great pianists we admire today would have been able to survive the requirements and judging standards of competitions such as the Cliburn. There have also been hints of favoritism among judging panels, with panelists "pulling" for a favorite student or otherwise being invested in a particular outcome. The truth is these competitions will continue to be held at regular intervals, anyone with enough money can start one, and only a small handful of the "winners" of these competitions will leave a legacy in the world of music. But the competition circuit serves as an important showcase of the young talent in a given year, and it seems to me that if a performer comes along who is truly gifted he or she would be recognized by any qualified jury barring extreme shenanigans. I have often wondered, however, if the competition format doesn't inadvertantly reward careful, note-perfect playing over more daring, inspired, or ground-breaking talent. Haochen was by far the most intellectual of the performers featured in the documentary. You got the sense that he was performing for himself in a private room and the rest of the audience just happened to be listening. Lanky, with a long face for a Chinese and long fingers, he seems in many ways to be the Chinese Glenn Gould. He plays haunched over the keys with a precise, pointillistic style, making several facial expressions that Gould made in his many videotaped recordings, including the repetitive "ta-ta-ta" gesture that Gould used during certain passages. Haochen gave his first recital in Shanghai when he was five, performing all of the Two and Three-Part Inventions of Bach. There are some who think Yao Ming was genetically engineered by China's state-run sports system. You wonder if someone over there "produced" this guy intentionally. Even the shape of his fingers, especially his 1st and 5th, resemble Gould's! There are three performances of Haochen's that are featured in this documentary: Chopin's Prelude No. 16 in B-flat Minor (presto con fuoco), a Mozart concerto, and Stravinsky's Petrushka Suite, which is included in its entirety as a DVD extra. The Mozart concerto is only fragmentary in the film, and there is just a whiff of a Prok 3rd, which isn't really enough to write about. Haochen's Petrushka Suite is quite good. He has a very good sense of rhythm and excellent control, especially for his age. The suite is often played by pianists who want to upset audience's expectations, which usually results in an indulgent and not very interesting bang-fest. Haochen plays much of the work at a comfortable mezzo piano, but is able to retain its rhythmic vitality. Watching Haochen in this video made me feel like his playing would translate the best to audio recording. He makes use of a very subtle dynamic register and he seems almost indifferent to the audience. The Chopin prelude I felt was less successful. Haochen definitely leans towards literal interpretation, and his prelude lacked any kind of emotional flare. He played it like it was a Bach prelude. He also seems to lack power in his fingers in places (this is evident in the Stravinsky as well), which could be attributed to physical development or to a more cerebral approach to practicing. Nobuyuki is featured performing La Campanella, Hungarian Rhapsody No. 2, Schumann's Piano Quintet, Chopin's Concerto No. 1, and Rachmaninov's Concerto No. 2. There is also mention of a Hammerklavier being played at some point, but all we get in the doc is the final few bars and audience's reaction. Nobu has a real sense of drama in performance. His playing seems most suited to the concert hall. He has good technique, although with Nobu you feel that the music takes precedence over any technical considerations. His hands "stick" in just a few places. Often when large chords are required, Nobu seems to take a fraction of a second to double-check that his hands are in the right place on the keyboard. But these small irregularities did not seem to detract from the experience the way they would with another performer. It reminded me a little of Horowitz, whose playing was so interesting you almost didn't notice the occassional hiccups. A quick search of available recordings shows that Nobu has made the most of his Cliburn victory. I look forward to sampling the recordings he has released and reviewing them here. Yeol Eum is seen performing both the Prok 2nd in rehearsal and I'm pretty sure the Prok 3rd in performance, although I could be wrong since this seems to be against the rules of the competition. Her DVD extra is Liszt's Rhapsodie espagnole. Yeol Eum is a showman (or woman). She is not intellectual like Haochen, and you can't say based on this documentary that she is particularly poetic like Nobuyuki. She reminded me most of the crazy Hungarian pianist Gyorgy Cziffra. She is about maximum effect. Her playing is loud and visceral. She plays double octaves like a Tyrannosaurus Rex crushing a shelf full of smurfs. All of the pianists in this documentary were very good technically. If I were to offer criticism here it would be that Yeol appeared sometimes to be carried away by her own playing. She apparently recorded all of the Chopin Etudes some years before this competition when she was 18. I plan to find a copy of this.